Sorting from largest to smallest is an easy way to arrange objects; a gradient sort is efficient and boring. More interesting is a pyramid sort; for a mountains comparative view, the shape of the sorted objects mimics the shape of the objects themselves. The shortcoming of the pyramid sort (and of the gradient sort) is in the amount of space it occupies. Overlaying smaller mountains on top of the larger ones in a pyramid fashion yields a tight, sorted set. 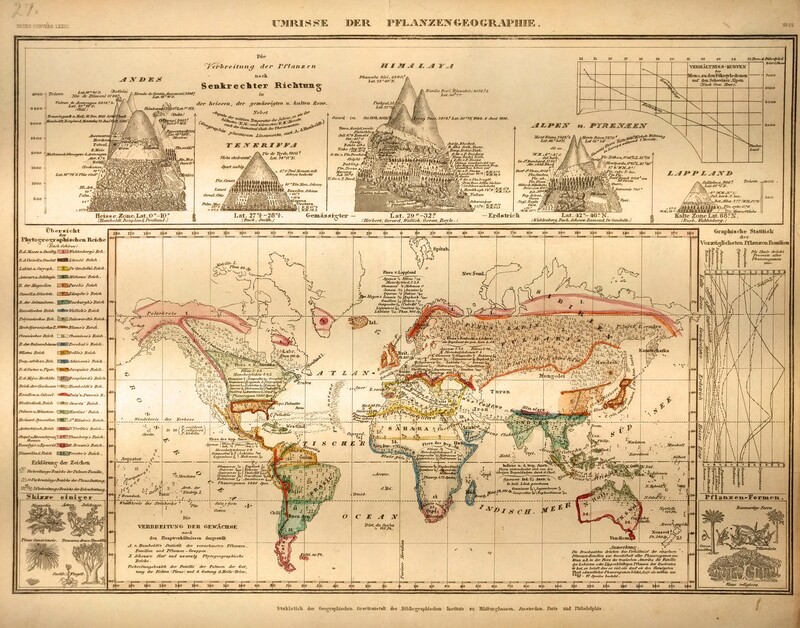 Finley, in 1827, published the first mountains comparative with an overlaid pyramid sort. Some ten years later, Tanner merged the mountains and rivers compound comparative style with the Finley’ mountain sort. In his work, the mountains were centered, the eye immediately drawn to the tallest, and the rivers were arranged in an inverted trough sort to compliment the mountains with the longer rivers on the edges. By 1850 at least two other cartographers, Mitchell and Cowperthwaite, published the same plate, a testament to its design elegance. His work was not without flaws. The design pointed to the tallest peak, Dwahalagiri (Everest was ten years away from being surveyed), with the smaller peaks hidden in plain sight. Moreover, he left the middle of the mountains exhibit wide open, wasting space that could have displayed mountains from intermediate height ranges. His exhibit shows 151 mountains and volcanoes, about 25% fewer than the other mountains and rivers comparative maps of the day. Taken together, flaws and all, this work is beautiful and elegantly uses space. An innovative arrangement for a comparative view, this chart no doubt influenced other comparative maps for decades to follow. Want to learn more about comparative maps? Check out my free ebook! Living in the blogosphere I’m always interested in a good read and to see what other bloggers are doing. Here are a couple blogs to share. JF Ptak’s History of Ideas Blog is a fascinating trip back in time studying interesting and often obscure topics. Not strictly maps, it’s still a great read and often covers them. Associated with his bookstore, Ptak keeps it updated regularly. Maps and Art is the blog of a gallery by the same name located in Florida. Many of the posts are short, but they are insightful and usually link to other authoritative resources. Updated periodically. A new blog from National Geographic and authored by the writers who brought us Map Lab at Wired magazine, All Over The Map is a bit of an unknown quantity. Based on their previous work, however, and the posts to date, it looks like it will be a keeper. I hope you’ll take a look at these blogs. Tell me what you think and let me know your favorites. If you picked up my blog recently you may not have seen some of my earlier pieces where I defined the rules for a comparative view. Here’s a rundown. A comparative map (I use comparative map, comparative view, and simply comparative, interchangeably) is a map designed to show and compare the principal features of the planet, be they mountains, rivers, lakes, waterfalls, or islands. Is a comparative actually a map? Insofar as a map is a reductionist picture of the Earth, absolutely! Generally speaking, comparative views were published in school and home atlases for the general reader, either as stand alone pieces or as a part of another map. The way features are arranged on a comparative is important. Rather than being arranged as they appear on the Earth’s surface, they must be arranged by height, length, or whatever characteristic is to be compared. Further, the features must be arranged so as to appear like a single mountain range, etc. Some high level grouping is OK, by continent or hemisphere, but not at the individual feature level. Sorting is critical as well. It is the quality that imparts the comparative nature of the genre. Without it, the reader sure would have a tough time determining relative sizes. Common sorting styles are simple gradient, pyramid, and trough. Whatever the style, the piece must use an accurate scale! The extras that cartographers include in comparatives are a great treat! Sometimes it’s a balloon, sometimes a bird or mountain climber. Rivers comparatives often show lakes, deltas, and adjacent cities. These help to provide a sense of scale to the piece and embed a little extra information. Most importantly, they provide some delightful 19th century whimsy. Want to learn more about comparative maps? Download my free ebook! Meridians and observatories go hand in hand. In fact, of the many ‘local’ prime meridians, no less than four ran through astronomical observatories (New and Old US Naval Observatory Meridians; Greenwich Meridian; and Paris Meridian). There is good reason for this: in the days before GPS (and even after) navigation was by the sky. Our modern day prime meridian, through Greenwich Observatory in London, divides Earth north-to-south into two equal hemispheres. It serves as the basis for standard time. It is a recognized standard for describing locations east or west on the globe. First, let’s establish that there are no natural laws that dictate placement of a prime meridian. Unlike the equator which naturally goes around the fattest part of the planet, there is no such circumferential line through the poles, nor are there any other properties making one ring better than another. With this in mind, it is obvious that the meridian would be placed where it was administratively and politically convenient. Ptolemy, in his Geographia, was the first to use a prime meridian. Sea fares proposed a magnetic prime meridian, but in retrospect we see that this was not feasible. Magnetic north and true north are not one in the same; using a line through magnetic north would result in either meridians (besides than the prime meridian and antimeridian) running at other than perpendicular to the equator or meridians that did not converge at the poles. British Royal astronomers developed the lunar method of determining longitude. With this method, a ship’s navigator would ascertain the position of the moon in the sky and refer to tables to determine the time at a reference point. Comparing the time at the reference point with the local time (also determined astronomically), the navigator could determine longitude (each hour of difference was worth 15 degrees of longitude distance from the reference point). It was the astronomers at the Royal Observatory, Greenwich who compiled the necessary reference tables, all tied to Greenwich. The Greenwich meridian took off, and near the end of the 19th century, well over half of all ships used it as their reference point of longitude. In 1884, delegates of 25 nations met for the International Meridian Conference, where they agreed to establish the Greenwich meridian as the prime meridian. Many living in the late Victorian period would have known of the importance of and debate over the prime meridian. With that in mind, in addition to astronomical discoveries of the day (Neptune), astronomical observatories would have been of interest. With that in mind, it’s not a surprise that many comparative maps showed the heights of observatories. A widely agreed upon prime meridian meant that navigators and map makers could be certain that each was describing the same spot on the planet as each would be measuring longitude from the same spot. Establishment of a prime meridian would affect Victorians’ lives in a more day-to-day fashion: standard time. Prior to standard time & time zones, each town set their clocks by high noon. This was complicated by the success of the railroads. To prevent train wrecks, railroads set their clocks to consistent times across their areas of service. While effective within a railroad system, connecting to another railroad was complicated. Imagine that you were to board a train in town A, where local time was noon, but railroad time was 11:50 AM, traveling 1 hour to town B, where local time was 1:15 PM but railroad time was 12:50 PM, connecting to another railroad’s train that departed at 1:15 PM on that railroad’s time which is 15 min behind local time in town B. The solution: everyone in a geographic area agree to set their clocks to one time, minimizing the frequencies of changing their watches. I am running a periodic series where I interview some of the people collectors come across. My purpose is to shed light on what they do and how they work, especially for new collectors. For the second post in this series I interviewed Eliane Dotson, owner of Old World Auctions in Glen Allen, Virginia. Old World Auctions has been in existence since 1978 and Eliane, along with her husband, purchased the online auction house in 2007. She developed her interest in maps from being around her father’s collection. Although not a collector, she is passionate about maps and describes her career as giving her a chance to work with them everyday. Indeed, the best part of her work is the opportunity to research maps daily. Eliane says of 15th and 16th century maps that they “combine art and history” making them among her favorite pieces. A few times per year maps that she hasn’t come across make their way to Old World Auctions, giving her a chance to “bring their stories to life”. When pieces come in on consignment, Eliane explains that they are thoroughly researched, their authenticity, condition, and other relevant information cataloged, and they are imaged using a rolling scanner over three feet wide. Each auction, conducted virtually, is managed well in advance, as this process underpins each listing in the auction catalog. She further asserts that Old World Auctions researches and describes each piece in far more detail than other auction houses. When asked about recent trends in the map market, Eliane reports seeing an increased interest in 20th century pictorial and political maps. Maps showing westward expansion of the United States have also been popular. Eliane describes the community of map dealers and collectors as very tight knit and “really great to work with”. For new collectors she offers some advice. Collectors should identify their collecting interests, know what the market is like, and know the maximum amount they are willing to spend to acquire a particular map. As an aside on map prices, she mentioned that with the digitization of the map trade, collectors are able to see the inventory of dealers far away; this allows more transparency into availability and has worked to hold prices down. Returning to advice for new collectors, she suggests collectors “buy the best quality you can afford” and maps in the “best condition possible”. In the interest of full disclosure, I am a satisfied customer of Old World Auctions. The Great Lakes are North America’s ecological crown jewels. Providing sandy beach and marsh shoreline as well as littoral, pelagic, and benthic habitats, and the largest freshwater lake system on the planet containing 21% of freshwater, the lakes support diverse life both in the water and within the watershed. The St Lawrence River supports still more riverine life. Their distinct shapes are visible from space, and their importance extends further to human populations, commerce, and more. With these substantial roles in mind, I am sure to look at the Great Lakes when inspecting a comparative view, either one of lakes or a rivers piece that includes lakes. 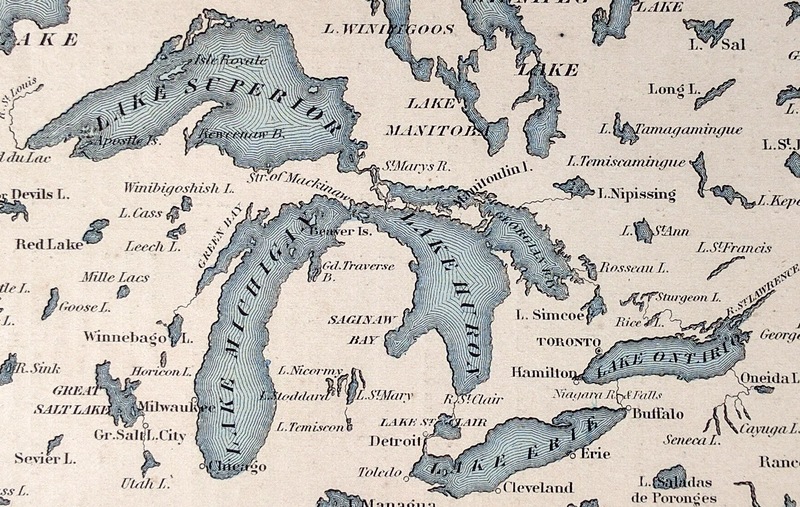 The Great Lakes take several morphologies on comparative maps. I use Lake Michigan as my benchmark and most of this post will focus on Lake Michigan, but it is not unique in its shape evolving. In lakes comparatives (some of rivers, too) dating to around 1850 or later, Lake Michigan takes its characteristic kidney bean shape; it is shown looking more like an eggplant prior to that. Further, on most rivers comparative views, its shape is all over the map (pun intended). Lakes comparative views are less common than their mountains and rivers cousins. That said, with even a few we can evaluate the differences among them. The most apparent difference to an American reader is the shape of Lake Michigan over time. As mentioned above, it goes from eggplant to bean shape over the course of twenty or so years. Knowing that the bean shape is true, you may wonder whether the cartographer simply made a mistake. I can dismiss this out of hand as maps contemporary to the said comparative also show the lake as straight. The other possibility is that the cartographer got it right vis-a-vis the information available at the time, and it was a true cartographic error (an inaccuracy in the map due to mistaken information available at the time); this is the most parsimonious explanation. A review of later maps alongside other sources explains the change. In 1836 Michigan joined the Union and Wisconsin in 1848. These admissions required precise measurements of boundaries and a survey was performed, yielding the modern understanding of the lake. 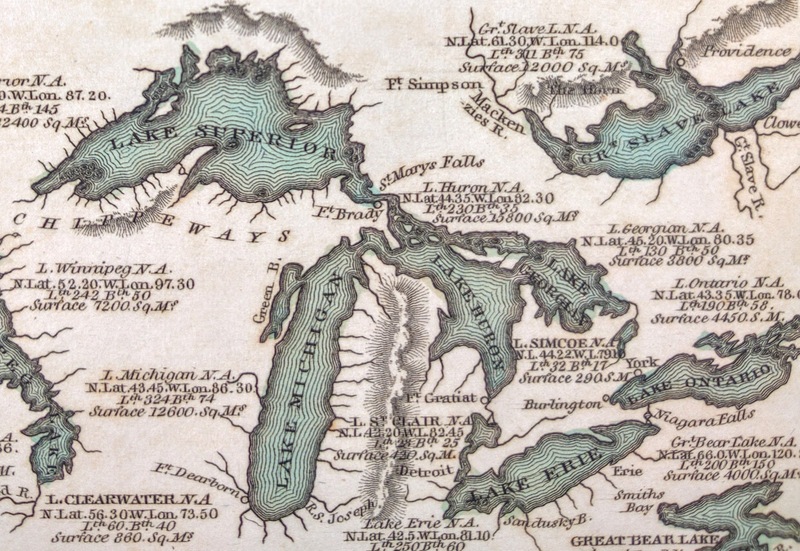 The Michigan Geological Survey, authorized by the state legislature on the day of its formation in 1836, is a candidate (still my hypothesis, I’m researching now to confirm) for the source of these revised maps. Lakes appearing on rivers comparative maps run the gamut from faithful renderings to examples of great license. Such is the case with depictions of Lake Michigan and there’s a simple reason for this. Rivers comparative maps are concerned with the length, and to some extent other physical characteristics; lakes, especially tangential ones, are of low priority. Considering the Lawrententian system extends from Duluth, through the great lakes, and along the St Lawrence to the Atlantic, Lake Michigan is not on the longest path. Any inclusion of it on a rivers comparative is more contextual than critical. To that end, cartographers can be excused for taking liberties with its orientation, size, or showing it at all. Great Lakes detail of Mitchell’s 1860 ‘The World in Hemispheres’ (own work). The reader will “get it” when reading one of these maps as they are coming in with the understanding that they are seeing rivers rather than lakes. This isn’t too say that showing lakes doesn’t add value, it does. The lakes aid the reader in identifying the river system, understanding the watershed, and appreciating the human population the system sports. When a river system’s orientation is changed, say so that it flows to the edge of the page, the lakes, also reoriented, assist the reader in realizing this. Want to learn more about comparative views? Check out my free ebook! Spring is in the air here in the Mid Atlantic, flowers are in full bloom, and trees are getting their leaves. 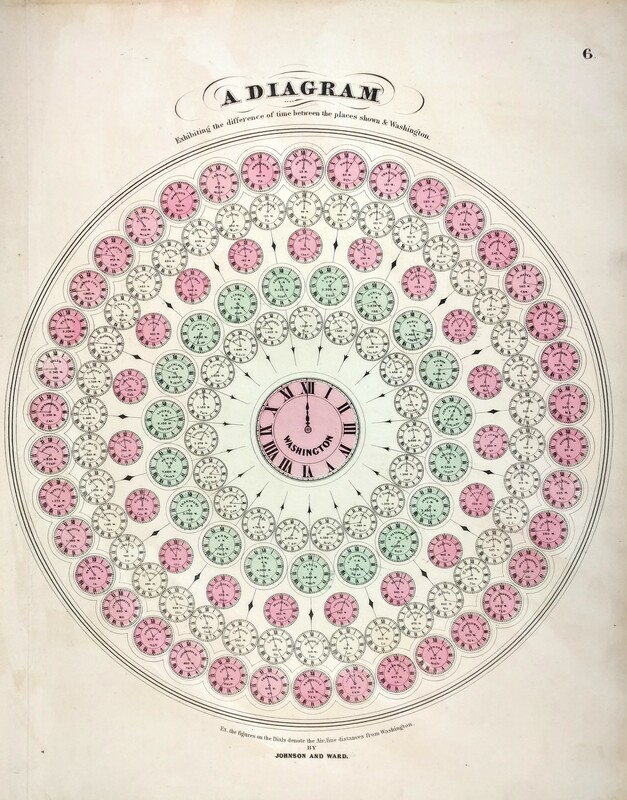 The 1800s have been called the golden age of data visualization and during this time, statistical and thematic maps came into their own. 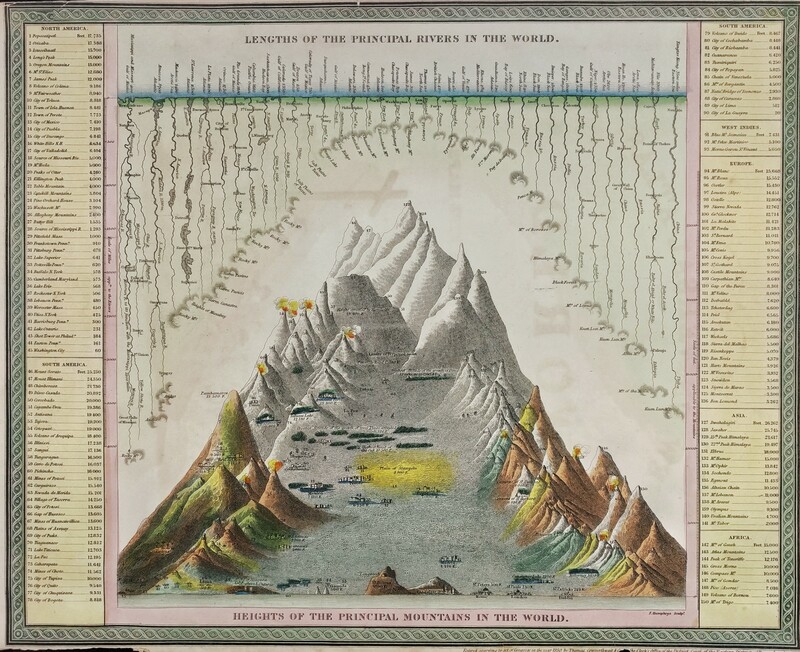 Alexander von Humboldt’s Geography of Plants, documenting his exploration of Mount Chimborazo, gave rise to various depictions of plants and climatic data on maps. Meyer’s Umrisse der Pflanzengeographie, translating to something like Survey of Plant Geography, is just one of those thematic maps showing a tremendous amount of data on the distribution of plants. About 1850 Meyer set out to publish his hand atlas containing a cache of physical and thematic maps. Umrisse der Pflanzengeographie appears to be a copy of a piece from another atlas rather than an original work. 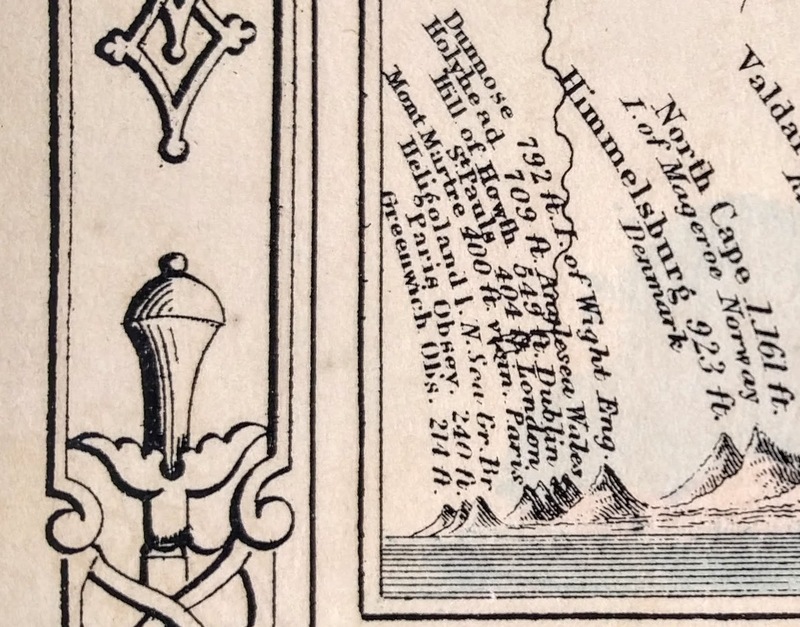 OK at the time, many cartographers duplicated the works of others, often buying plates. In this case, Umrisse der Pflanzengeographie was first published by Berghaus sometime about 1840. The Mercator projection in the lower center of the map is color coded according to the climate. This follows the isothermal line style map which Humboldt developed, where lines are drawn to show bands of common temperature (or more generally climate). This map shows an idea that’s a precursor to the modern concept of biomes. Biomes are areas of similar types of life and climate, but are not as specific as the groupings in this map. That this map shows proto biomes is significant. The mid 1800s were the early days of modern biology. Darwin was making his observations of finches which would underpin On the Origin of Species and Gregor Mendel was studying genetics in pea plants. So it fits that this map describes the beginnings of ecology. The mountain figures at the top show the distribution of plants on mountain faces across both altitude and latitude. They show latitude, altitude (in toisen, an obsolete unit of measure akin to a fathom), prominent cities, and plant distribution. The tallest mountain shown is Dhaulagiri (Everest would not be surveyed until 1856) at 4390 toisen, the highest peak above sea level. Mount Chimborazo also makes a claim as the highest peak when measured from the center of the earth. As the map shows, Chimborazo is clearly equatorial; since Earth is slightly squished at the poles, bulging at the equator, it gets the little boost it needs to edge out Dhaulagiri. This set of figures bears a resemblance to a comparative view but is not one because the mountains are neither shown in height order nor are they on a continuous landscape.